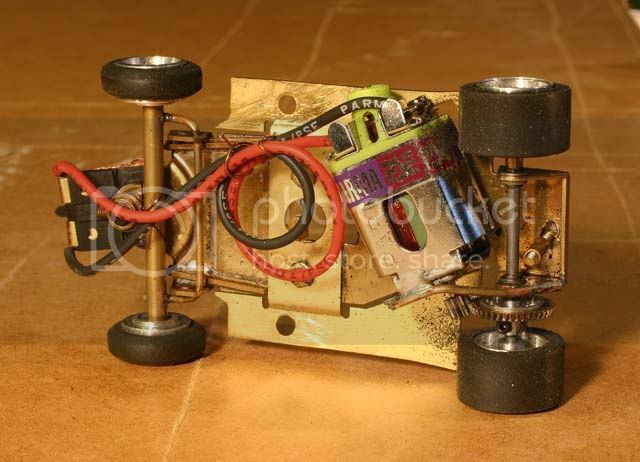 My question is this, would some of you designers/scratchbuilders please explain how your brass chassis' work? What is the function of each rod, and plate. I see some very complicated designs out there, with many components, strenthening rods, subframes, etc. And I don't really understand what the advantage is over a simple "one-piece" plate design, or over a simple but elegant design like the BWA chassis. I know that controlling chassis flex and weight distribution are probably the main issues, but I'd like to see the details explained. Hopefully with some photos or diagrams. Same here. On some of those chassis I would like to know which rods freely float and turn and which ones bend like a torsion bar. Now this is just my thoughts, but these brass chassis were made for commercial tracks rather than smaller home tracks whether plastic of routed. I built many back in the 60's, but other than the pure satisfaction of making one today, I doubt they would be significantly better than a RTR chassis properly tuned on the track...though they sure would look nicer. Basically it depends on how much you want out of a car and with what for power and on what kind of track. Brass and plastic home tracks seems to be at the point of why bother. No real gains to be made here with a brass chassis. So we need to concentrate on routed tracks of some decent size and power say a bigger club track, to get the brass type chassis's best affects. The simpler/heavier the brass chassis the nicer it behaves for slower speed tracks because of the weight to replace the magents used on plastic tracks. Now the bigger tracks with plenty of power allows the brass chassis and hotter motor to come into it's own. Complexity though is not always the best style for all. It depends on the experience level and driving style and how much speed you want on what type track. As with real racing cars they are finely tunable for the track being run on. And you can build for the amount of speed and handling you want by the built in tuning you select. Real cars have shocks and sway bars and tire pressures and many other tuning devise's to allow this. Slot cars are too small to get down to these levels. So it comes back to the basics of weight transfer and traction for cornering to put the power down to where it is all at. Speed on the straights is fine but you win or lose in the corners. As you will probably notice, we will be dealng with two main car componets here, the main chassis center section of guide shoe, motor, drive line and the movable weight, body component. There are several methods or achieving weight transfer and cornering traction. 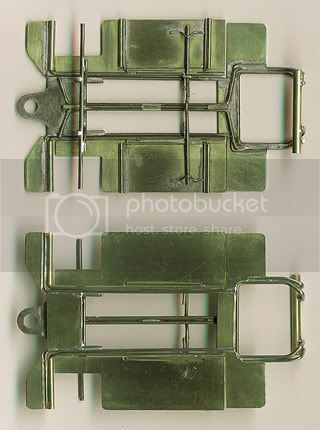 Such as allowing the body weight to shift from side to side and from front to rear as you learned with plastic chassis cars by loosening the mounting screws. Loose or tunable body mounting can transfer weight from side to side. 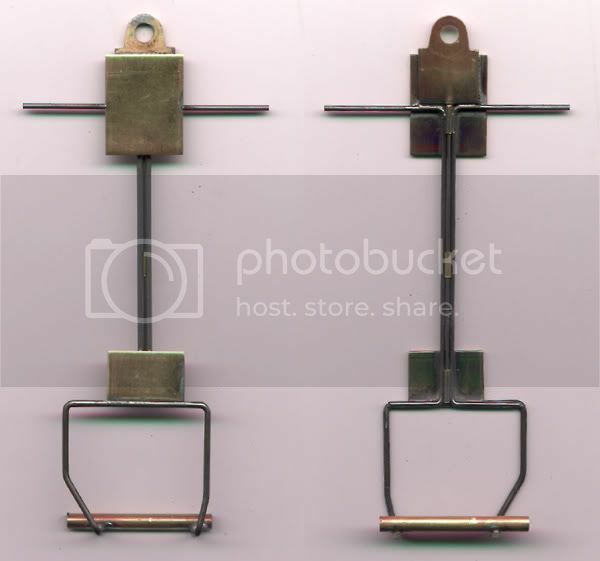 Moving, hinged side pans can do this by allowing the body to float or rise up from one side to the other. The weight moves to the outside side of the car in a corner to put the weight on the tires needing the most traction. Left to right weight transfer in a left hand turn, puts the weight on the right hand tire which needs the most traction. Not a lot of movement is needed to get the effect. Too much can hurt and tip the car over. This is where you can tune the amount of lift. As with too much traction and the tires dig in and the car tips. Torsion bars can do this also with more movement in different directions allowed. Torsion bars allow side to side lateral movement as well as vertically to one side or the other. They also as well allow a twisting of the frame sperate from the body to adjust for track undulations. Rear steering type frames allow the guide shoe and its mount to shift the center chassis sections and the motor faster to one side or the other than the body which is isolated momentarily from the center section. And sends the weight transfer again to the out side rear tire helping it steer the rear end center section around quicker. 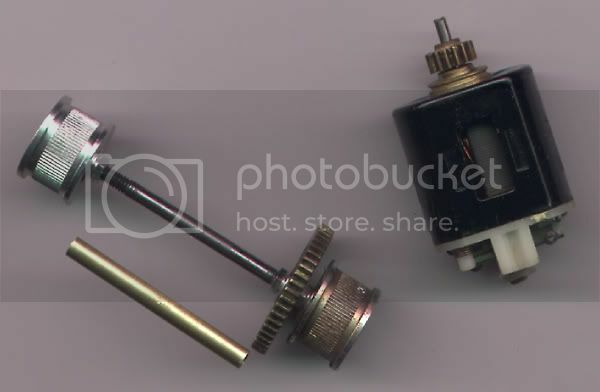 All this movement allows insulation of motor and drive train components vibrations from affecting the body and reduction of effect on it and vise versa. Now thats probably more than you ever wanted to know about brass chassis tuning. And I did not point these items out to you. I will try in a later post to post a picture of these items in a chassis or two and point out the torsion bars and floppy pans etc. And how they can be made. Or any one else can jump in here and show their versions or ideas for you. 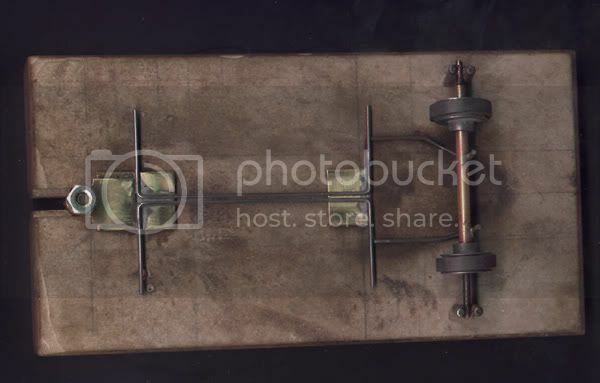 I have been able to build a very fast car in brass, with a motor, rear axle, and guide all on the same center pan. Chassis is a modified Parma I-32. 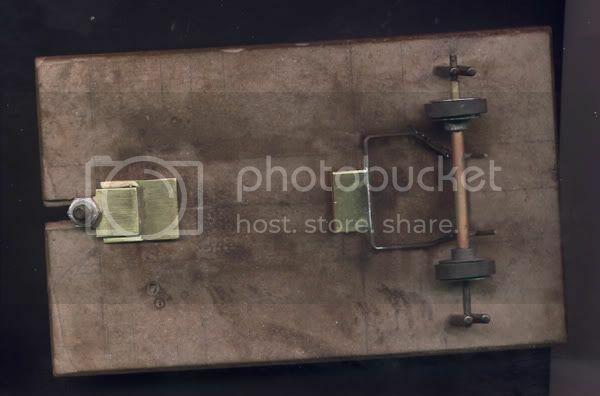 Two side pans, connected by a bridge, float on the center pan and carry the body. The front axle has leading links which connect it to the center pan. There are no torsion rods or springs, and the whole thing rattles. It beats a Slot.It every time, but mostly because the motor is more powerful (Super 16D). 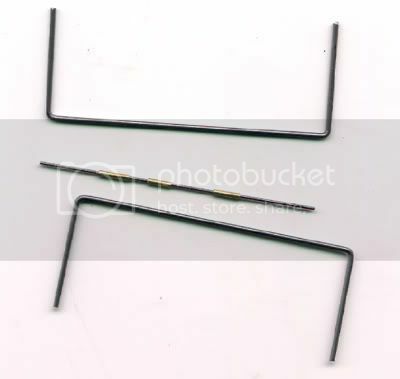 The basic idea of the soldered brass specials is to allow a controlled flex of the rear end (motor and rear axle), relative to the front end and body. Numerous ingenious links and "floppy pans" were devised, but none worked as well as the Parma Flexi, which simply bends to allow the rear end to sway while the guide, and front wheels, stay closer to level. The TSRF chassis should be studied to learn some principles of chassis design. 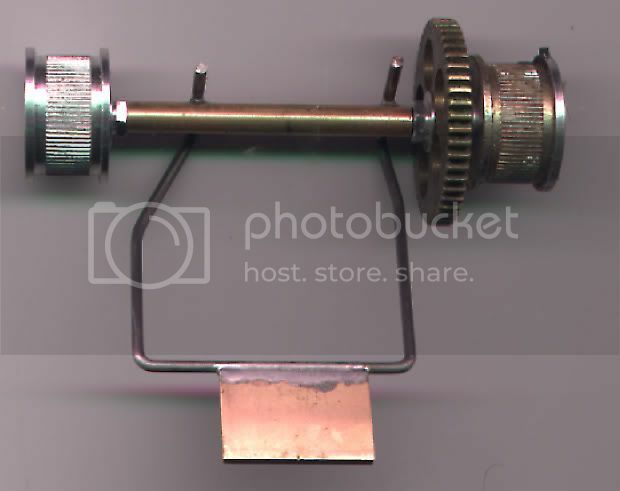 The plastic backbone keeps the rear end in the same plane as the guide pin, while the metal pan, loosely attached to the backbone, is kept level by the front wheels. These chassis demonstrate very good cornering, if tweaked where the plasic clips hold the metal pan, in order to allow free (but limited) movement. Brass or metal chassis designs are great on plastic to lower your cg when running no magnet or putting in ballistic motors. Plastic rtr chassis usually can suffice with tweaking mag or no mag if it's decent to start with. funds really dictate what's needed on plastic track and how fast, or competitive you want to be. On a commercial track your ingenuity can be key. However even then a "space" chassis and lexan blob body will still win. Don't forget making your own from plastic sheets, tubes and extrusions. They can be good runners as well. Body moves on chassis, front axle goes up and down. Looks complex, is simple. That is one cool looking build, Robert. Thanks for posting! Notice how Robert has repositioned the front axle holder so that he can use wheels that are closer to scale size. Another brass chassis you can use as a foundation is Al's "adjusto" brass chassis that I added side pans to. I had Larry build me a chassis last year and it set a new level for smooth handling in my padock due to his tortion bars. 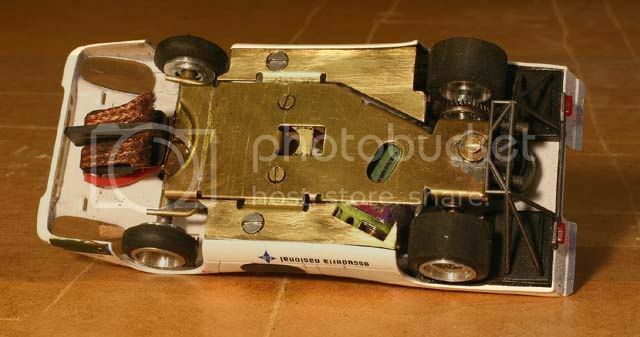 Chris Briggs also make a nice chassis for 1/32 that uses a lot of weight to lower the center of gravity. OK, Pantera...you axed for it. This is a 1/32 sidewinder derived from the original 1982ish Ian Fisher flexiboard or torsion bar design. The spine itself is .032" piano wire and three small pieces of .032" ID brass tube soldered into a track made of two pieces of .055" piano wire with roughly a .032" gap. It is solidly secured to the guide flag plate on one end an the "motor box" on the other. All of the other rattling, hinging bits basically hang from this center spine, motor box unit. Next, the side rails, front axle tube will be soldered in...we'll tune this chassis by soldering that little piece of tubing in place and additional bracing around the motor will be added. It's going to look a little less sporty normal because the wheelbase is a barge-like 4.75" and the nose is really short so tucking the guide flag under all of this is a challenge. Dan, it's about $1.00 worth of material (and it looks it!) but this is the basic structure of a torsion bar design. So far everything flexes but doesn't hinge or float. You can stick some wheels, a guide flag and a motor in this skeleton of a frame and watch it twist, flex, absorb shock and practically steer around corners...but that we be like going out in public naked. Fine work up above by Bob S. It's good to see a clear, step by step explanation. What fascinates me is that the rear axle movement, relative to front axle, is a "constant" in fast chassis design. There are several approaches, and if you feel uncomfortable building, you can buy a Slot.It chassis and have the same thing, provided you loosen the motor pod screws to allow the pod to move. Same goes for the Pro Slot Toyota GT-1. My feeling is that the faster cars must have flex. The stiff "shingle" design of most plastic RTR's can be modified, with carefully placed chassis cuts, pivots, and hinges, to make them handle better and go faster. Usually, around 10 feet/second is the zone in which this level of design is needed. Below that, the one piece shingles keep up with the flexibles. Robert, the Slot.It motor pod tuning tip is the best way to get a big performance improvement. I guess this secret performance tip isn't a secret anymore. All of this fancy schmantzy scratchbuilding was designed among other things, to get the rear wheels to steer a little. Loosening the motor pod screw on a RTR does a really good job of creating the steering effect. I've soldered a piece of .055" piece of music wire on each side. You can go with lighter wire such as .032" if you want more flex. I chose .055 because of the weight and high centre of gravity of the motor requires more support. If you look closely there is one piece of .047" music wire snaking along the rear of the spine and around the motor box on each side. It's extra bracing and probably not necessary but it makes the builder look like he or she knows what they are doing. The wheelbase is now 4" because I feel like building a Chappy 2G instead of a hard bodied stocker. You can test the flex of the chassis by grabbing it with both hands a twist! If you put your thumb in the middle of the spine you will find it feels mushy and bows and sags too much. This where that tiny piece of brass tube is for. Slide it along the length while periodically pushing down with your thumb. There will one tiny spot where the spine magically doesn't bend. Solder it in place and you have a frame that twists and bends in every direction except longitudinally. Or you can go all the way down to the other end of the food chain or chassis chain as the case may be. For just ripping around a track at home this set up works just fine. You can add plenty of weight or magnets up front by the axle. Or not. I took the magnet out as once the body was on it needed neither weight or a magnet. The chassis pictures that others have posted are just amazing. What great workmanship. Ok guys good suggestions and showcasing of others work with brass chassis and scratch building, since that was what was asked for. Here is a simple chassis of the rear steer and torsion bar type I did some years ago and it still runs very well on routed tracks. This image shows the main chassis parts. The large perimeter brass piece is the body mount plate and holds other parts in place. It show how the other main parts work with it. The brass piece in front of the motor and the motor mount and rear axle carrier and the guide shoe mount comprise the center section. This center section moves sideways between the body mount sides. This allows the guide shoe to transfer the cornering forces acting on the guide shoe from the slot. To move the rear drive unit and wheels sideways before the body pans do, so they transfer weight to the out side corner to provide out side tire traction. The torsion bars mount up front on the body pan unit, and attach to the rear motor mount and rear axle unit. They allow a limited twist to the frame center section side to side and in a longituninal rotation along the center line of the chassis. With no center hinge pins the torsion bars play a big part on body movement sideways up and down and the twist of the center section to the body mount piece. They need down stops to prevent the body mount pan areas from dragging the track. The top view shows the down stops in front of the rear body pin mount tubes. This car handles very well and is great fun to drive with good hot motors such as the Cheetah or Falcon. The design has evolved a bit more as time as gone by. As will be shown in the next example when I get some more time.